Google suffered an outage to all its properties over the weekend, lasting around five minutes worldwide. According to Google, 50 to 70 percent of requests to its web apps returned errors for around one minute. The company said service was mostly restored the following minute, with all its properties fully functional four minutes later. Google did not provide the cause of the outage. According to the Google Apps service level agreement, customers can request a credit if monthly uptime drops to a band between 99.9 and 99.0 per cent. In that case, customers can either get three days' worth of service added to their term contracts, or the equivalent monetary credit for monthly postpaid terms. 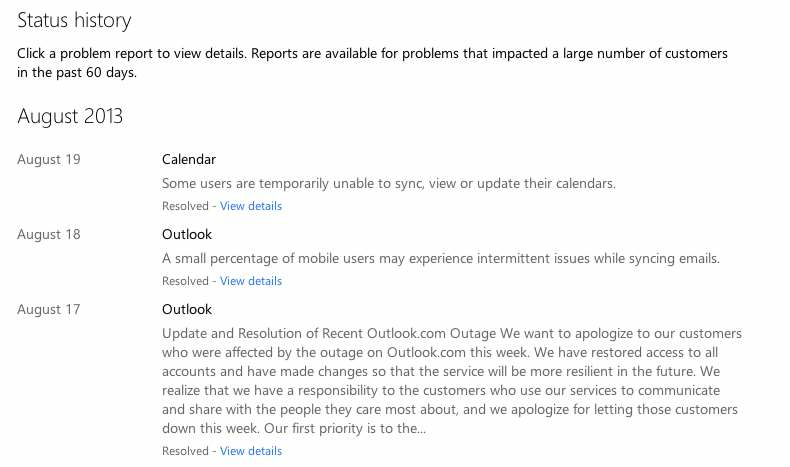 Microsoft's Outlook.com service also suffered an outage over the weekend, with users still reporting problems with the service. According to Microsoft, the ouage was caused by "a failure in a caching service that interfaces with devices using Exchange ActiveSync." Smartphones and other devices attempting to connect to Outlook.com received error messages and continously tried to reconnection to the service, Microsoft said in its post-mortem of the outage. Microosft had to temporarily block access to Outlook.com via Exchange ActiveSync to stablise the email service, and will change the way it does error handling and further increase network bandwidth to handle the large number of requests encountered.